Fully Funded! | Be Nice. Today is a very happy day! I am pleased to share that the Kickstarter fundraiser for the printing and distribution of the Be Nice. Guide to Farting and Pooping brochure was SUCCESSFUL! Thanks to the generous support of 52 Backers – and a number of people who spread the word – the project received $543! The original goal was beat by almost 15o bucks! I am so thrilled, so elated, I cannot begin to express it! THANK YOU! What this means is that the project will be available to many more people and the extra funds will go to more printing and/or a few other ideas I have currently shaping in my mind. Your enjoyment and support of this project is a blessing, and something that gives me joy on a daily basis. Thank you for letting the work be a part of your life! This entry was posted in Be Nice. 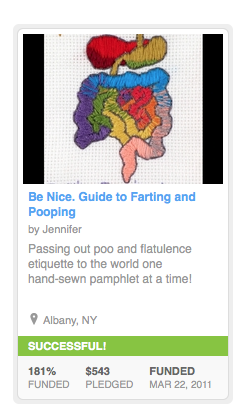 Events, Kickstarter Fundraiser and tagged Be Nice, farting, Guide to Farting and Pooping, Kickstarter, pooping by Jen. Bookmark the permalink.